The Bank of Spain has just made an announcement regarding the country’s bad bank plan which fleshes out more details of the proposals following the recent consultation period. The press release and presentation are here and here, respectively. The bad bank (known as Sareb) will be a for profit company (expecting a 'conservative' return on equity of 15%), majority owned by private investors (read other Spanish financial institutions) with a minority government stake. It will have 8% capital. Its duration will be up to 15 years. 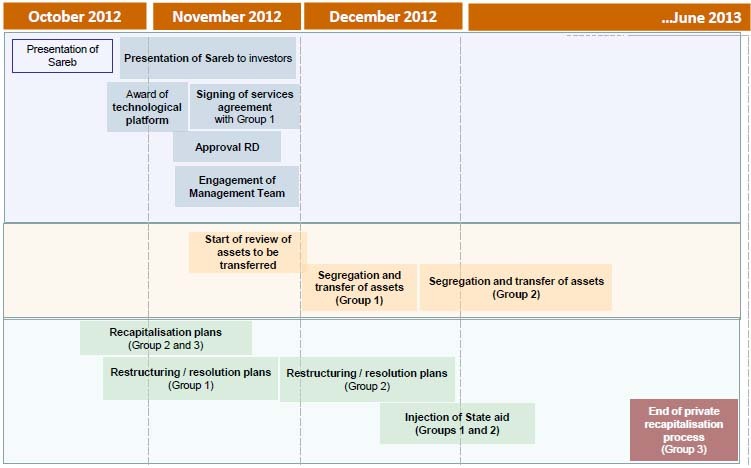 A transfer of up to €90bn of assets will take place in two stages. Stage 1 will see around €45bn in assets transferred from the most troubled (already nationalised) banks. Other banks will transfer assets in a secondary stage. (See picture below for the timetable). The valuation of assets will work from the baseline scenario of the Oliver Wyman stress tests (which we analysed here). It will be adjusted for the ‘costs’ of transferring the assets to Sareb. (See below for a breakdown of rough valuations). - One phrase that caught our eye was this: “The transfer price is not a reference for the valuation of non-transferred bank assets.” According to whom? Surely just asserting that this is not reference for the valuation of assets means nothing unless the market agrees? As we saw with NAMA, the market will still price broader assets of the prices used in the transfer, hence long standing market distortions in Ireland. - The delayed/staggered nature of the transfer of assets could create a two tier market for similar assets, since the ones valued in the bad bank will be valued much lower than those kept on by the viable banks. This could hamper the viable banks attempts to sell off assets at reasonable values. - The write downs, although substantial, still seem lacking in areas (not least due to the flaws in the OW baseline stress test scenario). For example, assuming foreclosed land will be worth 20% of previous value may seem substantial, but when there is an real estate oversupply which could take a decade to unwind the prospect of this land being worth anything soon seems unlikely. - The timeline looks positive with significant progress expected in the near future, however, the full transfer of all assets to Sareb could run well into middle 2013. This delay could drag out the issue and further distort the price discovery in the Spanish real estate market. Also as Zerohedge points out, this timeline may be fine in a vacuum but with everything else going on in Greece, problems could escalate quicker than expected. - As we’ve noted before, although the private investment is positive, it looks likely to come from mostly other Spanish institutions. This furthers the ‘nationalisation’ of banking sectors and intertwines the problem banks with the healthy banks. - The plan seems to be, since the institution is not a majority owned by the government, that it will not appear in general government liabilities. It's not clear whether this will pass muster with Eurostat, or how any losses/transfers from the public sector will impact government finances. Overall then, a bit of a mixed bag. Some positive plans and it’s good that the plan is progressing (if a bit later than desired) but still plenty of potential pitfalls. 1 potential buyer for 17 sellers, there are currently (June 2012) 1.9 million houses for sale, 2.6 million houses are empty and 1.3 million are still in construction. So how on earth can anyone in their right mind think that a discount of 32.4 percent on the current book value of finished homes will be even remotely enough? And this gets only worse when one considers that the book value is presumably much much higher than the actual market value in this almost bidless market. In reponse to the previous post, I do not expect anyone thinks 32.4% is enough. This is a game of smoke and mirrors to avoid the inevitable choices for the Eurozone. Either they start closing the project or the liabilities of the system have to be mutualised - i.e., the Germans have to pay.